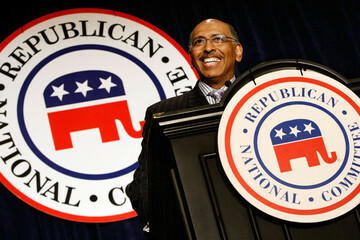 Poor Michael Steele. No matter what he says or does, hard-line conservatives -- both inside and outside the Republican Party -- simply won't cut the GOP National Committee chairman any slack. Ever since Steele was elected the party's first black national chairman 18 months ago, conservatives -- who never wanted him to be chairman in the first place -- have sought to undermine his authority. Now, several prominent conservatives have called on Steele to resign after a video surfaced Thursday of remarks the RNC chairman made the day before during a GOP fundraiser in Connecticut, in which Steele called into question the U.S. war effort in Afghanistan -- even as he criticized President Obama's handling of it. Responding to an attendee's question about Obama relieving General Stanley McChrystal of his command of NATO forces in Afghanistan after the general made disparaging remarks about administration officials in an interview with Rolling Stone magazine, Steele called McChrystal's firing "very comical." McChrystal was replaced by General David Petraeus, the commander of U.S. forces in Iraq. McChrystal's dismissal is "a reflection of the frustration that a lot of our military leaders have with this administration and their prosecution of the war in Afghanistan," Steele said. "Keep in mind again, federal candidates, this was a war of Obama's choosing. This is not something the United States had actively prosecuted or wanted to engage in." It seems that Steele has forgotten the fact that the war in Afghanistan is one that Obama inherited from his predecessor, George W. Bush, who sent U.S. forces to Afghanistan to root out al-Qaida and its Taliban hosts two months after the September 11, 2001 terrorist attacks, in which al-Qaida operatives hijacked four commercial jetliners and slammed them into New York's World Trade Canter and the Pentagon across the Potomac from the nation's capital, destroying the twin towers, damaging the Defense Department's headquarters -- and killing over 3,300 people in the process. Had passengers aboard the fourth hijacked jet headed to Washington not fought to take back control of the plane -- a struggle that ultimately sent it plunging into a field in Pennsylvania -- the hijackers would have likely slammed that plane into either the White House or the Capitol Building. For Steele to say that the war in Afghanistan -- which pre-dates Obama's presidency by nearly eight years -- is "a war of Obama's choosing" is ludicrous. But that's not what's gotten Steele in trouble with conservatives in his party. "It was the president who was trying to be cute by half by flipping a script demonizing [the war in] Iraq, while saying the battle really should be in Afghanistan," Steele said. "Well, if he's [Obama] such a student of history, has he not understood that, you know, that's the one thing you don't do, is engage in a land war in Afghanistan?" Steele went on: "All right, because everyone who has tried, over a thousand years of history [From Ghengis Khan to the Soviet Union], has failed. And there are reasons for that. There are other ways to engage in Afghanistan." It is those remarks -- that the U.S. should not "engage in a land war in Afghanistan" -- that has Steele in hot water with conservatives. After all, Republicans had pushed Obama last fall to heed General McChrystal's request for a "surge" of 40,000 troops in Afghanistan -- double the number of American forces that Bush sent in the controversial Iraq "surge" two years earlier. By Friday, Steele was in full damage-control mode. In a statement issued through the RNC, the embattled chairman said, "As we have learned throughout history, winning a war in Afghanistan is a difficult task. We must also remember that after the tragedy of September 11, 2001, it is also a necessary one. That is why I supported the decision to increase our troop force and, like the entire United States Senate, I support General Petraeus' confirmation. The stakes are too high for us to accept anything but success in Afghanistan." Steele's clarification on Friday, however, failed to stem the criticism, as top Republicans continued to blast the chairman in appearances on the TV talk-show circuit Sunday. Senator John McCain (R-Arizona), the 2008 GOP presidential nominee -- who is himself locked in a fight for his political survival against J.D. Hayworth, a right-wing radio talk-show host, in the August 24 primary -- blasted Steele's remarks as "wildly inaccurate." Appearing via satellite from Afghanistan on ABC's "This Week," McCain stopped short of calling for Steele's resignation, but did say that he thought "Mr. Steele is going to have to assess as to whether he can still lead the Republican Party as chairman of the Republican National Committee." Also in Afghanistan over the Independence Day weekend, Senator Lindsey Graham (R-South Carolina) told CBS' "Face The Nation" that he was "dismayed, angry, upset" at Steele. "It was an uninformed, unnecessary, unwise, untimely comment," Graham said. "If you're a student of history, you would know that America cannot afford to allow Afghanistan to go back into Taliban control," Graham continued. "We're not here fighting a ground war to occupy this country. We're here to help Afghans who can live in peace with us." Not all Republicans were voicing anger at Steele, however. Representative Ron Paul (R-Texas), who ran for president as the Libertarian Party nominee in 1988 and unsuccessfully sought the 2008 GOP presidential nomination, issued a statement Sunday in which he voiced his support for the embattled GOP chairman for speaking out against the war. "I would like to congratulate Michael Steele for his leadership on one of the most important issues of today," Paul said. "He is absolutely right: Afghanistan is now Obama's war. During the 2008 campaign, Obama was out in front in insisting that more troops be sent to Afghanistan. Obama called for expanding the war even as he pretended to be a peace candidate." Paul called on Steele to stay on as RNC chairman. "Smart policies make smart politics," Paul said. "He [Steele] is guiding the party in the right direction and we are on the verge of victory this fall. Chairman Steele should not back off. He is giving the country, especially young people, hope as he speaks truth about this war." Later on Sunday, the Texas Republican, appearing on CNN, asserted that the war in Afghanistan "truly is Obama's war," even as he acknowledged that it began during Bush's presidency. "Obama said, 'This is the good war' and he's expanded the war, but the American people aren't with him," Paul said. "The majority of the American people are tired of the war and they want to see it ended. They want to see our troops brought home." Significantly, there has so far been no comment from Rand Paul, the Tea Party movement-backed GOP nominee for the U.S. Senate seat in Kentucky being vacated by the retiring Jim Bunning, and son of the Texas congressman. Steele had sharply criticized the younger Paul in May after the Kentuckian said that he opposed the anti-discrimination provisions of the landmark 1964 Civil Rights Act being imposed on private businesses. Steele said Rand Paul's libertarian views on the role of government and civil rights "got in the way of reality, and the reality of it is that was important legislation at the time, put in place important benchmarks for the progress of free people." He called the GOP Senate nominee's remarks "misplaced in these times" and that they were out of step with the rest of the country. That conservatives have heaped scorn on Steele in the wake of his remarks on Afghanistan should surprise no one. The episode is only the latest in an ongoing soap opera in which the right wing has attacked Steele relentlessly ever since he announced his candidacy for the RNC chairmanship after the party suffered a drubbing in the 2008 election. The race for the GOP's top post was a bitterly-fought contest that was riven with charges of racism, prompting Bob Bennett, an RNC member and former chairman of the Ohio GOP, to brand it "the dirtiest [campaign for the party leadership] ever." Bennett was a staunch supporter of the RNC chairman Steele defeated, Mike Duncan, who sought a second two-year term. Steele was forced to face down vicious accusations by right-wing party hard-liners -- often anonymously -- that he did not possess a true conservative philosophy and that he was actually a social liberal. Only hours before they were to begin voting for the RNC's next chairman, the Republican National Committee's 168 members found fliers that had been slipped under their Washington hotel-room doors depicting a partially unfurled roll of bathroom tissue with an accusatory headline: "Soft is fine for toilet paper, but not for a chairman of the Republican National Committee!" Shortly after Steele announced his candidacy for the party chairmanship, his photograph and all mention of him as a founder of the Republican Leadership Council disappeared from the RLC's Web site. Among the RLC's members include the Log Cabin Republicans, an association of openly gay Republicans which strongly supports expanding civil rights protections for gays. Steele said he had "joined" the council only to reach out to liberals as a conservative and help "unite the party." James Bopp Jr., a conservative RNC member from Indiana, issued an e-mail to other committee members in which he openly accused Steele of lying about his relationship with the RLC. In the spring of last year, party conservatives forced Steele to agree to accept restraints on his control of millions of dollars in party funds and contracts -- an unprecedented curb on the powers of the RNC chairman, who, until then, had enjoyed almost unrestricted authority over how to spend the party's funds. In January of this year, Steele was accused by two of his predecessors of attempting to personally profit from his speaking engagements at colleges, trade associations and other groups, raking in as much as $20,000 in honorariums, or speaking fees. "I've never heard of a chairman of either party ever taking money for speeches," former RNC chairman Frank Fahrenkopf said in an interview with the right-wing daily The Washington Times at the time. "The job of a national chairman is to give speeches. That's what the national party pays him for." Fahrenkopf's criticism of Steele was echoed by former RNC chairman Jim Nicholson, who told the Times that the job "demands so much of your time that you can work 24/7 and not get everything done, so taking time out to speak for the benefit of one's own bank account is not appropriate." As chairman, Steele earns an annual salary of $223,500. As the GOP's right wing -- including a chorus of neoconservatives led by William Kristol, founder and editor of the Weekly Standard who is also a board member of the of the right-wing foreign-policy think tank Keep America Safe, and Liz Cheney, the think tank's co-founder and chairman -- demand Steele's immediate resignation, Steele is likely to face an all-out right-wing challenge if he decides to stay on and seek a second two-year term next January. North Dakota GOP Chairman Gary Emineth, a social conservative, is stepping down to prepare to run against Steele for the RNC chairmanship after the November midterm elections, according to The Washington Times. Emineth insisted, however, that he intended to challenge Steele for the chairmanship for the RNC's loss of financial support from major donors during Steele's tenure. "I was shocked at the last RNC meeting to learn how little money we got from our major donors," the Times quoted Emineth as saying. Regardless of Emineth's motives, there is little doubt now that Steele's future as the national chairman of the Republican Party is on the line. The question is whether the embattled chairman will step down now or fight to keep his job. Either way, the GOP now faces a major internal mess that -- because Steele is the party's first black chairman -- potentially could get very ugly, the last thing the GOP needs just four months before the November election.